With the most important event in the exhibition calendar for Quality Control and Metrology equipment and services suppliers fast approaching we continue a series of preview articles highlighting a few of the many new and innovative solutions that will be showcased at the Control Exhibition May 7 – 10th in Stuttgart, Germany. The LOTOS automatic measuring system inspects the full external contours or individual areas of any measurement object quickly and precisely, irrespective of the shape. The three-dimensional, non-contact measurement is carried out using optical measurement sensors with accuracy in the µm range. The result is a representation of the measurement object as a 3D model. Powerful, intuitive software allows the measurement results to be assessed quickly. Easy integration into any data environment as well as traceability and reprocessing for all measurements make the measuring systems suitable for an extremely wide range of applications. LOTOS systems enable a three-dimensional measurement to be made of the entire outer contour or a freely definable section of any measurement object. The measurement object is turned on a rotary stage. At the same time, a high-precision vertical measuring stage is used to move a multi-dimensional laser sensor along the measurement object to measure its entire outer contour. This contour can be inspected fully automatically for pre-defined geometrical properties offering a wide range of applications for in-process and quality control inspection. A new MVM from Opto is a digital microscope and features apochromatically corrected microscope optics and a 5MP Sony IMX264 sensor. A coaxial incident light illumination as well as a diffuse ring light are integrated. Both illuminators are controlled and powered via the USB 3.1 interface of the integrated camera. Specially developed control electronics allows alternating and simultaneous operation of the two light sources. With an image field of 4.5 x 3.8 mm, a pre-calibrated measuring resolution of 1.8 µm/pixel and a working distance of 31 mm, the MVM offers an optimal compromise between resolution and size. The integrated measurement software is optimized for `stand alone` applications and the camera control for integration tasks. The MVM is a 70 x 150 x 40 mm compact machine vision microscope and allows the integration of microscopy into any application. 3plusplus with present its software for contact-free measurement of undercuts. Depending on customer requirements, a profile sensor is integrated directly into the production line or as an out-of-line device. Data acquisition and evaluation are performed by the software as per DIN 509 with identified characteristics are logged and exported. using the software the part inspection in a laboratory with a profilometer or coordinate measuring machine can be eliminated. 3plusplus is able to combine the undercut measuring with other measurement and automation tasks. Monetary and time efforts are reduced due to the easy sensor integration and the measuring method. Furthermore, major reconstructions are avoided and individual requirements are specifically implemented. Electronic autocollimators are highly precise optical angle measurement instruments used for the measurement of the most minuet angle variations as well as angle adjustments of optical components. Within the machine tool industry electronic autocollimators are used for the measurement of straightness/parallelism of machine guide ways, for pitch and yaw measurement of machine slides as well as for determining positional uncertainty of rotary and index tables. The new MÖLLER-WEDEL electronic autocollimator offers a totally new hard- and software design. Due to a direct digital signal conversion in the sensor head the signal to noise ratio has been significantly improved and characterized by a tenfold increased measuring frequency and wider dynamic range. An integrated alignment aid allows a simple, fast and precise adjustment of the autocollimator and can be operated independently without a notebook PC. Straightness measurement software has been integrated into the display unit allowing fast and easy “on-the-fly” measurement. The standards in gear measuring technology are extremely high, requiring accuracy in the nanometer range with short measuring times and high information density. 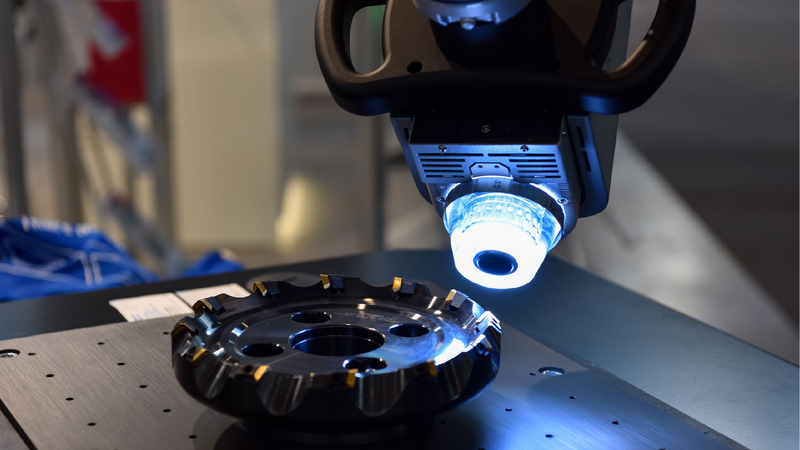 To meet this challenge, Klingelnberg launched a new hybrid technology that combines the advantages of both tactile and optical measuring technology. The advantage of rapid measurement with optical sensing is combined with the flexibility and extremely high accuracy of the 3D NANOSCAN tactile sensor ensuring that the potential of optical measurement can be utilized without compromising measuring accuracy. The hybrid system is designed so that the optical sensors can be adapted in a variety of ways allowing Klingelnberg to avoided committing to one sensor principle only. Due to the high-speed scanning sensor, any number of axially symmetrical components can be digitized through rapid scanning with an extremely high point density. The “Optical Measurement” option includes the high speed OPTOSCAN optical sensor with a rapid change feed unit, sampling and visualizing point cloud software, and the GOM-3D evaluation software. Foundrax is launching its next generation Robus Brinell hardness testing machine at Control 2019 and will exclusively preview its new low force Brinell range of machines. Alex Austin, Foundrax MD said: “We’re excited to launch the new Robus machine at Control this year. This development delivers a high accuracy Brinell hardness testing capability from the most robust benchtop system on the market. Our machines deliver laboratory precision hardness testing in steelworks conditions and we pride ourselves on the accuracy, repeatability and lifespan of all our equipment. We have one example of a machine that has performed around 35,000,000 tests!” Foundrax will also be demonstrating the larger floor standing BRIN400D, a rugged, shop floor Brinell hardness tester that carries out fully automatic indentation and measurement for production level applications. This robust and reliable machine has been designed to meet the customer’s most demanding requirements in harsh industrial environments such as those found it forges, foundries and steelworks. With the pintec modular clamping system users can fix fast and easily difficult shaped workpieces in the metrology room. Ideal for small part numbers and prototypes pintec offers a practical and flexible solution for the metrology room with the ability to measure quickly a complex formed work-piece. All too often it’s not cost-effective to build a special fixture for coordinate or optical measuring machine inspections. The pintec flexible fixturing system offers an easy, fast, professional and effective solution. Pintec is also successfully used in the fields of laser-and needle-engraving.